Ballykissangel is a Drama programme. 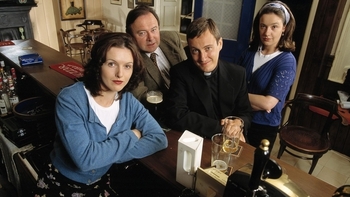 Drama series about a young English priest who is transferred to a small Irish parish, Ballykissangel. His arrival provokes much curiosity among the locals. Several surprises await him, including his ultraconservative boss Fir MacAnally, the fiery barmaid Assumpta, and plans for a hi-tech confessional in his church, St Joseph's. Ballykissangel is a tiny village. The crew and cast of Ballykissangel seem to take up most of it whether at the church or on the street.